I lost my mojo. Then I found it on a plane. I am on an Aberdeen-Birmingham flight. The plane is small and full. As I sit down on my aisle seat, I do my best to tuck in my limbs so as not to irritate the window-seat passenger. My mindset on flights is that unless the passenger next to me looks particularly friendly and/or initiates a conversation, I’m willing to sit there in silence for the duration of the flight. A little brutal maybe, but it’s the safest option. I am halfway into a paragraph in my book when I hear the voice of a young lady in the seat across from me. She is talking to the passenger next to her. She laughs a lot. I do not hear the other passenger (a man) speak for the first 15 minutes of the conversation. She talks and talks. I learn that she is 23 and got married about 18 months ago. I learn that her husband is a doctor and a similar age to her. I also gather some information about her 2 siblings – one a brunette and the other blonde (she is a red-head). Believe me, I try not to listen but I think the whole plane is listening. She isn’t perturbed by the quietness of the passenger she is chatting with. He nods and smiles from time to time. About 30 minutes into the flight, his voice becomes more audible. He laughs. I hear that he has a girlfriend and has been to Aberdeen only a handful of times. The two talk for the 1-hour flight, with the young lady leading the conversation, asking questions and probing for detailed responses. I have to be honest. I am half irritated by her. I have a book in my hand and I can’t get through more than a couple of pages due to the distracting conversation. We passengers glare at her periodically, hoping she just ends the conversation. We already know too much. The other half of me greatly admires her. She is bold and confident. At 23, I think she displays tenacity that is uncommon in many young women. I think about my safe option to keep to myself on planes (and in other public places, especially places that ‘move’ e.g. trains). I have let the fear of rejection change how I behave in certain situations. Being an extrovert by nature, I have a lot to say, a lot going on in my head that I want to share. But more and more, I don’t. I think it’s not important. Or the slight frown coming across my listener’s forehead becomes my cue to be quiet and withdraw. As we disembark from the plane, the man thanks the young lady for great company as it helped the time pass quickly. I can’t help smiling. I want to thank her too. I’m glad to witness that young lady on the plane. I am on my way to attend a workshop (I wrote about the workshop here). The workshop is an awesome experience in part because of the young lady on the plane. I walk into the venue deciding to be yourself and not to shrink when people don’t take me on as I hope. I smile and talk to complete strangers with no malice even when they appear not to welcome my intrusion. It is liberating and I have fun. My spirit is light. My soul, gratified. I am not holding back. My extroverted nature has been partially suppressed for years. In fact, I think there are times I lose it. Somehow, I’m finding it and I want to keep it even when I’m gray. I just need to have more faith in who I am. And gentle (and not so gentle) reminders are welcome. Thank you, Red-Headed Young Lady :-). The Digital Academic….Could that be me? Today, I attended The Digital Academic Tools & Tips workshop hosted by Piirus and jobs.ac.uk at the University of Warwick. It was greeeat! Throughout the conference, I tweeted about it and really enjoyed doing it. I got a real buzz. I even increased my twitter following by about 20% in a span for a few hours as a result of tweeting the event. Mind you, 20% of nothing is nothing haha but you get the idea. The speakers were Dr Nadine Muller (Lecturer in English Literature and Cultural History at Liverpool John Moores University), Andy Tattersall (Information Specialist at University of Sheffield) and Dr Inger Mewburn (blog owner at The Thesis Whisperer, Director of Research Training at The Australian National university). I learned about what academics are like and how they think social media and its obvious challenges. Some of them are stylish, some are quiet, some are extroverted, and many have strong opinions about how to make working in academia better. And all of them are brilliant, experts in their fields!! It was a real thrill being there. Part of my motive was to get an inkling as to whether academics would mind being around me and if I’d mind being around them. I also wanted to know how I might merge my love of social media and blogging with my academic aspirations. 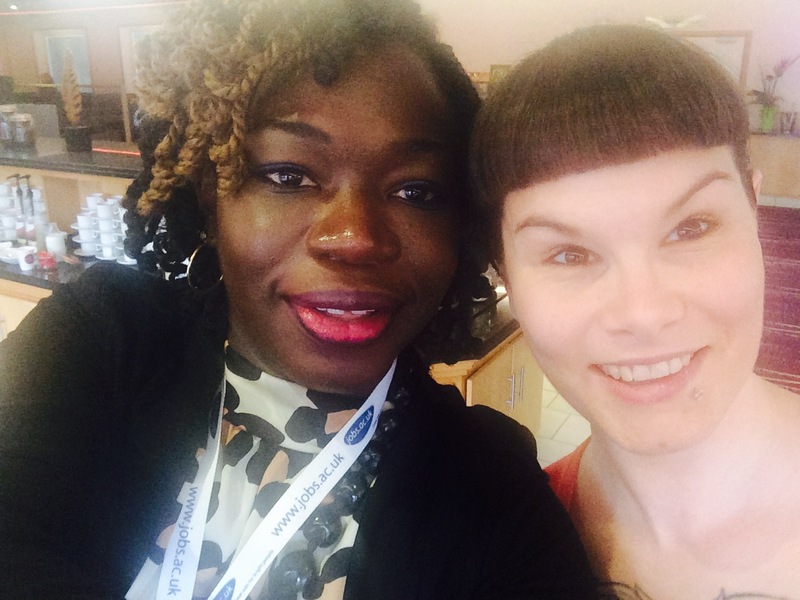 My high of the day was taking a selfie with the amazing Dr Nadine Muller (check out her beautiful blog http://nadinemuller.org.uk). She has the coolest tattoo on her chest – and that’s coming from me who is not keen on tattoos as such. – Build a network of supporters and potential collaborators through digital tools- it makes research much more fun! I made a mental note to look into Mendeley (for research publications) and Haiku deck (for blow-their-minds PowerPoint slides). Dr Lily Canter has written about the workshop here. It’s much more articulate than I could muster at this point in the evening. I’m excited to let you know I’ve started a new blog. As I wrote in my last post, a new journey has began as I embark on my doctorate degree and take a break from corporate life. The new blog will follow my research as a main theme with secondary themes on photography. I plan to write more personal posts here from time to time. It would be great if you could continue to follow me on the new blog. You have been so supportive over the nearly 5 years that I started blogging here. Things change and I’m hoping you’ll support that. Thank you so much! I appreciate every one of you.